Betty Shabazz, wife and later widow of Malcolm X, became an important political activist after the assassination of her husband in 1965. Betty Shabazz was born Betty Dean Sanders to parents Ollie May Sanders and Shelman Sandlin. Ollie May Sanders was a teenager and Sandlin was 21 when Betty was born. They were unmarried. Early records indicate that Betty was born in Pinehurst, Georgia on May 28, 1934. Because Betty was neglected by Ollie May Sanders, she was eventually placed with Lorenzo Don Malloy and Helen Lowe Malloy who became her foster parents. Betty Sandlin grew up as part of the black middle-class in Detroit, Michigan. The Malloys instilled in their foster daughter the value of education, grace, and Christian ethics. They also taught her the ideals of black self-help and protest through the National Housewives League which Helen Mallory started in order to support black businesses and boycott stores that refused to hire African American workers. Shabazz graduated from Northern High School in Detroit in 1952 and enrolled in Tuskegee Institute in Alabama where she began studying elementary education. She switched her major to nursing after months of working the front desk on the campus hospital. In 1953 Sandlin left Tuskegee and enrolled at Brooklyn State College of Nursing in New York City. She earned her undergraduate degree three years later in 1956. That same year, after attending many lectures of Muslim minister Malcolm X (formerly Malcolm Little), Betty Sandlin joined the Nation of Islam. She became Sister Betty X and for the first time began to publicly acknowledge racism in America. In January 1958 Malcolm and Betty married when Betty was twenty-three years old. Their Arabic name was Shabazz. Betty Shabazz gave birth to daughters Attallah, Qubilah, Ilyasah, and Gamilah. Shortly after Malcolm’s assassination in 1965, their twins Malikah and Malaak were born. Shabazz raised her six girls on her own, always trying to stay out of the media spotlight. She wanted her daughters to have a normal home life and full education. She also wanted them to know their identity. By the early 1970s Shabazz began giving public lectures which focused on the African American condition. While her speeches never challenged white supremacy in the manner of her husband’s orations, she through her own style, fought for education and human-rights causes, as well as issues crucial to women and children. In 1970 Betty Shabazz earned a Master’s degree in public health administration at Jersey City State College. Afterwards she held part-time positions in New York area colleges where she taught remedial reading and childhood health care, while she was completing her Doctorate in Education at the University of Massachusetts at Amherst. She received the degree in 1975. In the fall of 1976 Dr. Betty Shabazz joined the faculty of Medgar Evers College. She initially taught health sciences but eventually became the College’s director of public relations. Shabazz spent her final years trying to remind audiences of the historical legacy of her husband Malcolm X. By the early 1990s renewed interest in Malcolm X, including the 1992 Spike Lee film of the same name with Denzel Washington playing the title role, helped increase popular awareness of that legacy. Betty Shabazz died in the summer of 1997, three weeks after her 12-year-old grandson, Malcolm, set fire to her Yonkers, New York apartment. Shabazz was 63. 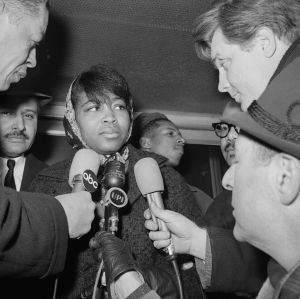 Russell L. Rickford, Betty Shabazz: A Remarkable Story of Survival and Faith Before and After Malcolm X (Chicago: Sourcebooks, Inc., 2003); Lawrence Otis Graham, "From Outcast to Heroine," U.S. News & World Report 122:23 (June 1997); http://www.gale.cengage.com/free_resources/bhm/bio/shabazz_b.htm. Heroine," U.S. News & World Report 122:23 (June 1997); http://www.gale.cengage.com/free_resources/bhm/bio/shabazz_b.htm.